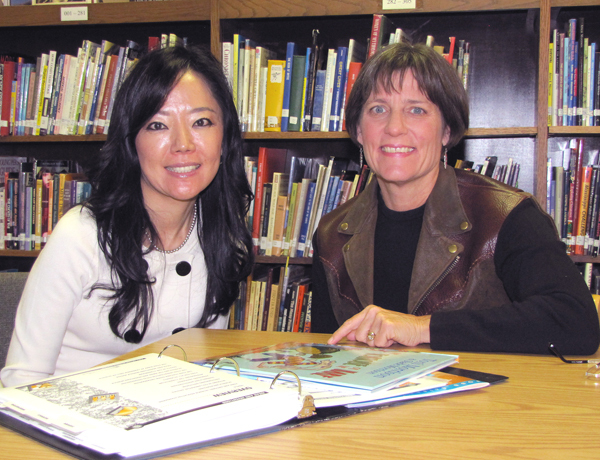 Jenna Shim (left), assistant professor of educational studies, recently was named the 2010-12 recipient of the Mary Ellbogen Garland Early Career Fellowship. Shown with Jenna is Mary Garland, founding College of Education Advisory Board member and president of the John P. Ellbogen Foundation. Jack (John) Ellbogen established the endowment in 2000 in recognition of his daughter's community service and philanthropy. Research exploring the impacts of skyrocketing enrollments of English language learners (ELLs) in Wyoming schools on teacher capacity to address student needs appropriately recently received a major financial boost from the 2010-12 Mary Ellbogen Garland Early Career Fellowship. Jenna Shim, an assistant professor in the UW Department of Educational Studies, is the latest recipient of the fellowship, funded by an endowment established by Garland’s father, Jack Ellbogen, in 2000. Jack Ellbogen created the fellowship in honor of his daughter’s commitment to community service and philanthropy. Where ELL population sizes once allowed a district to dedicate English as a second language (ESL)-certified teachers to provide additional academic support for non-native speakers, the recent growth now means that most teachers are, or will be, interacting with this student group. A major focus of Shim’s research will be exploring teachers perceptions about teaching ELL learners and comparing them with their classroom activity. Shim’s research will take her to classrooms around the state, where she will interview teachers and observe classroom interactions. Garland Fellowship funding will support Shim’s data collection trips around the state. Beyond identifying gaps between teachers’ articulated beliefs and instructional practices, Shim also hopes to bring what is learned back to the classrooms to “be able to work with teachers to develop more responsive pedagogy that would help ELLs succeed in schools and beyond.” Jenna has a basic framework entering this project but knows that, like any qualitative research, what she discovers in the field may yield new or different directions to explore. “You begin with these understandings and these theories, then you go into a classroom and realize that there are all of these unanticipated issues and questions that need to be addressed and answered,” Shim says. As an instructor of preservice teachers, Shim will be able to share findings with future educators and enhance her ongoing efforts to help prepare them for the multicultural mix of students they will encounter in their classrooms. In the process, she hopes to add new layers of understanding about the need to address the diverse needs of the children they will teach and equip them with additional tools to help those students succeed. “The question isn’t just about how you teach words in English, it’s about what kind of changes should be made to deep educational structures and assumptions so that they can be successful academically and socially,” Shim says. Jenna will draw upon her findings in another role: as the coordinator of UW’s English as a Second Language Endorsement Program. One potential question to explore, in the current research or the next phase of Shim’s academic work: how completion of the ESL certification impacts teachers’ classroom strategies and interactions. A comparison between ESL program graduates and teachers who have not completed the program also may be likely. Shim brings multiple layers to this research and to her approach to teaching undergraduates at UW. One of those layers draws upon her experiences as an English language learner. Jenna moved to California at age 10 with her parents from Korea. Her father is Korean; her mother is half Korean and half Japanese. Shim has experienced the same kinds of assimilation difficulties that many ELL students encounter. Not only is it impossible to separate her background from her scholarly activity, it also helps her to discuss the challenges English language learners face in a different way with her College of Education students.